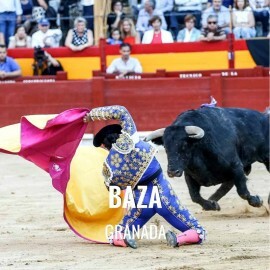 The Fair of Baza is considered one of the most important in eastern Andalusia, with a duration of ten days, always has in its program with major bullfights. As in the rest of the province of Granada, bulls are a fundamental part of the festivities. The town of Granada celebrates its Big Fair from September 6 to 15, in honor of the 'Virgen de la Piedad', whose big day is September 8. It begins with the appearance of the 'Cascamorras', a character that leaves Guadix with the intention of appropriating the Virgin of Mercy found in the Church of La Merced de Baza. The route is a spectacle and the townsfolk of Baza cover him with black paintings, they cheer him... The party dates back to the 15th century and since 2013 it has been declared of International Tourist Interest. 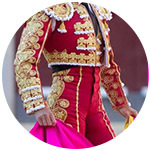 Around 8 September, the feast of the Virgen de la Piedad, Baza celebrates its Bullfighting Fair with a mixed bullfight where top-class bullfighters perform. On occasions they have also given festivities coinciding with the Virgin of August 15 or Santiago on July 25. Baza Bullring address: Avenida de Cascamorras s/n, 18800-Baza. Andy Cartagena with bulls from Albarrán and El Cordobés and Padilla with bulls from Jandilla, made the 'paseíllo' of the mixed bullfight in 2017. Caught in his first, El Cordobés could not continue. 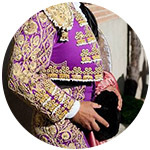 They left on shoulders with two ears the horse-bullfighter Andy Cartagena and five and a symbolic tail Padilla, after pardoning the last bull. In 2018 the mixed poster was composed of the horse-bullfighter Fermín Bohórquez and the bullfighters Juan José Padilla and Alberto López Simón, finishing all of them on shoulders. The bulls were owned by Bohórquez and Salvador Domecq for the fight on foot. We regret to inform you that, currently, Servitoro does not have tickets for this show, but we recommend other bullfighting experiences a few kilometers from Baza. Servitoro, Official Box office of bullfighting tickets sales Baza Bullring.